Manchester United v West Bromwich Albion at the end of 1978 is regarded as one of the finest English League games of the decade. The match contained many of the characteristic elements of domestic football of the era: packed terraces, a muddy pitch, all-British line-ups and managers, no shirt sponsorship, players numbered 1-11. An ugly aspect of the seventies was also in evidence with the booing of black players. West Brom were at the top of the First Division table at the time, eventually finishing third. Their manager Ron Atkinson took over from Dave Sexton at Old Trafford in the summer of 1981, signing his former player Bryan Robson for a then-British record fee of £1.5 million. Atkinson remained at Manchester United, winning the FA Cup in 1983 and 1985, until November 1986, when he was replaced by Alex Ferguson. Atkinson then had a spell managing Atlético Madrid, before returning to England and enjoying some success with Aston Villa and Sheffield Wednesday. This West Brom team featured several of their most famous players; alongside Robson was Tony ‘Bomber’ Brown. Coming towards the end of a long career, which began in 1963, Brown retired in 1983 as holder of Albion’s all-time league goalscoring (218) and appearance (574) records. Len Cantello’s goal won the Goal of the Season award on ATV’s Star Soccer show for the 1978–79 season. The game is chiefly remembered however, for the performances of Laurie Cunningham and Cyrille Regis, both in their youthful pomp and prominent among the trail-blazing black footballers of the seventies. They were the second and third black players, respectively, to be capped for England, after Nottingham Forest’s Viv Anderson. 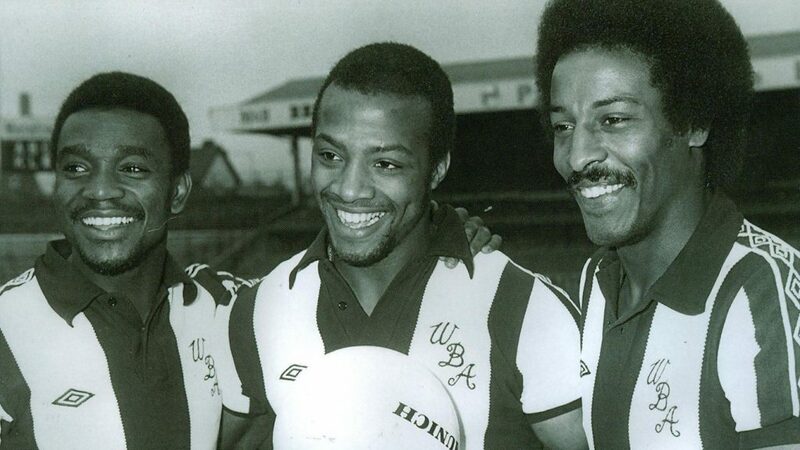 Brendan Batson made up the third of West Brom’s triumvirate, labelled ‘the Three Degrees’ by Atkinson, after the popular female vocal group of the time. After making his name at Leyton Orient, winger Cunningham established himself as one of English football’s most exciting players during two and a half seasons with West Brom. He secured a lucrative move to Real Madrid in 1979, where he became the first Englishman to represent the Spanish giants, achieving league and cup success. Persistent injuries hampered his career and restricted him to six England caps; he subsequently drifted through short spells at a number of clubs, though he won an FA Cup winners’ medal in 1988 as part of Wimbledon’s squad. He was playing in Spain for Rayo Vallecano when he died in a car crash in 1989, at the age of 33. Cyrille Regis was a powerful forward who moved to West Brom from non-league Hayes, earning five England caps as he established himself in the top division. After winning the FA Cup with Coventry in 1987, he reunited with Atkinson at Aston Villa in 1991, and his final clubs were Wolves, Wycombe and Chester. Regis died in January 2018, at the age of 59.